Nili Gold, who was born in Haifa to German-speaking parents in 1948, the first year of Israeli statehood, here offers a remarkable homage to her native city during its heyday as an international port and cultural center. Spanning the 1920s and ’30s, when Jews and Arabs lived together amicably and buildings were erected that reflected European, modernist, Jewish, and Arab architectural influences, through 1948, when most Arabs left, and into the ’50s and ’60s burgeoning of the young state of Israel, Gold anchors her personal and family history in five landmark clusters. All in the neighborhood of Hadar HaCarmel, these landmarks define Haifa as a whole. In exquisite detail, Gold describes Memorial Park and its environs, including the border between the largest Jewish and Arab neighborhoods in Haifa; the intersection of Herzl and Balfour Streets, whose highlight is the European/Middle Eastern Technion edifice; Talpiot Market, recalling Haifa as a lively commercial hub; Alliance High School and the Great Synagogue, the former dedicated to instilling a love of intellectual pursuits, while the synagogue was an arm of the dominant Israeli religious establishment; the Ge’ula Elementary School and neighboring buildings that played a historical role, among them, the Struck House, with its Arab-inspired architecture—all against the dramatic backdrop of the mountain, sea, and bay, and their reverberations in memory and literature. 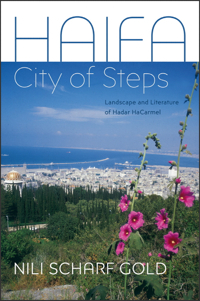 Illustrated with more than thirty-five photographs and six maps, Gold’s astute observations of the changing landscape of her childhood and youth highlight literary works that portray deeply held feelings for Haifa, by such canonical Israeli writers as A. B. Yehoshua, Sami Michael, and Dahlia Ravikovitch.